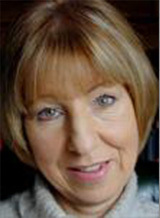 Judy's career began with a degree course in Textile Design at Leeds University where she won a postgraduate scholarship. She then began her work in retailing, culminating in 20 years as a top specialist in fine antique, portrait miniatures. On retiring in 2010, she returned to painting. She works from her home studio at Bourton on the Water in the Cotswolds, where visitors are welcome, by appointment. She holds Open Gallery days and exhibits locally. She paints in watercolour, pen and wash and mixed media. Subjects include landscapes, flowers, buildings, still life, animals and genre. Her inspiration comes from the beauty of the English countryside, both her native county Yorkshire, and her home of 24 years, the Cotswolds. Colour is the most important factor in Judy's painting, which comes from her years as a designer. Light and textures are also vital, she leans towards a strong colour palette which gives her paintings a fresh, lively quality. She is a member of, The 'Windrush Artists', 'Fosse Way Artists,' 'North Cotswolds Artists'and the 'Stow Art Group'. Greeting cards are available of many of her paintings, these are marked in the descriptions on the Gallery pages. 2019 exhibitions. For invitations please contact me. May 20th-25th The Oxford Artweeks at the Warwick Hall, Burford. June 1st-9th Home exhibition at my Gallery in Bourton on the water. June 20th-23rd with the Fosseway artists at Chorley's Auctioneers in Prinknash. July 2nd-9th with the Windrush Artists at Lower Slaughter Village Hall. August 26th-31st with the N.C.A.A. Warwick Hall, Burford.